Props can add to the overall yoga experience resulting in juicier and relaxing stretches. A yoga bolster is one of the most relaxing props used in yoga. A yoga bolster is similar to a body pillow but firmer. It is either in the shape of a rectangle or a more circular shape to create relaxation, help soften posture, or aid in opening up the body more. A bolster is more commonly used in yoga practices that need a little extra help such as prenatal or restorative. These yoga practices focus on stretching and relaxing the body which the bolster is wonderful in aiding with. 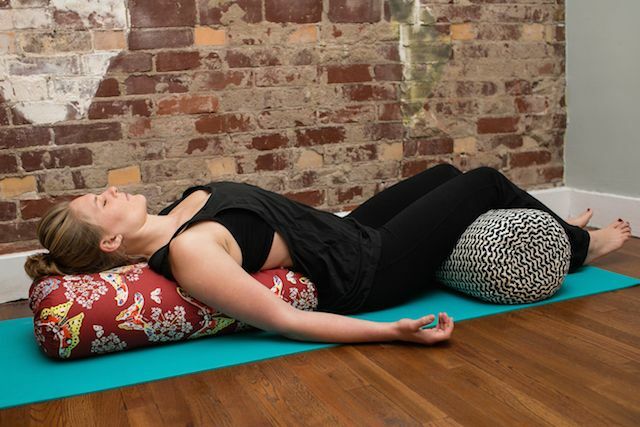 There are several poses that a bolster can bring to the next level of relaxation. Savasana is already a relaxing pose but with the added support of a bolster, it can be taken to a whole new level of relaxation and meditation. To use a bolster during savasana, place the bolster vertically behind you with the short end lining the lower back. After the bolster is in place, slowly lean the body back until the back is flat on the bolster. After you are laying on the bolster, cross the legs in a comfortable position and let the arms drape to the sides with the palms facing towards the sky. This position can help as long as needed, at the beginning or end of practice. Supported forward fold or Paschimottanasana also involves the use of a bolster. This pose is wonderful for stretching the lower back, spine, and hamstrings. To get in this pose, place the bolster on top of your stretched out legs. Next, inhale the arms overhead and then exhale to lay your chest on the top of the bolster. The feet should be flexed during this pose to keep from damaging the knees. The forehead can be placed on the bolster for even more comfort. This pose can be taken as long as needed to feel the full stretch and relaxation. Wide seated forward bend or Upavistha Konasana is traditionally done without a bolster with the forehead on the ground. However, some yogis need a little extra assistance getting into this pose or are unable to do the traditional forward fold due to injury or pregnancy. This is where the oh-so-helpful bolster comes in handy yet again. To use the bolster in this pose, stretch the legs as wide as the body will allow you to do comfortably. Place the bolster vertically in front of the pubic bone and flex the feet. Next, inhale to lengthen the body and then exhale to fold the body over the top of the bolster. If there is any pain in the knees, then add a micro-bend to prevent from overstretching. This pose can be taken as long as needed to stretch out the body. While yoga poses are wonderful on their own, props can be very helpful. Some poses can be difficult to get into, especially if the body is recovering or going through pregnancy. The yoga bolster is amazing for getting into classic poses with a little extra support.